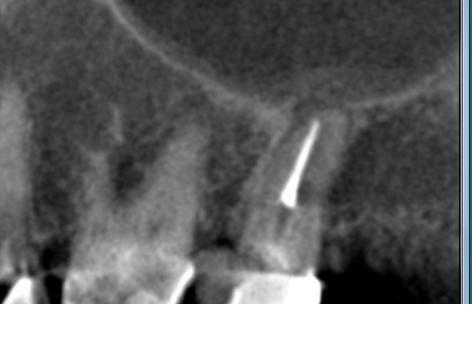 The Endo Blog: Evaluation of #2 for Retreatment, CBCT Revisited. 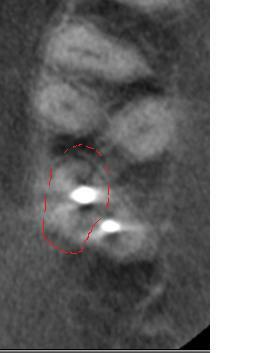 Evaluation of #2 for Retreatment, CBCT Revisited. I want to thank Dr. Hales for the introduction and for inviting me to contribute here on the Endoblog. I've been following and learning from the Endoblog for some time. It's my hope that I can not only share some of my knowledge, but also receive some valuable feedback from others who read this blog with other experiences and points of view. Many interesting cases, treated by myself and Dr. Stephen Parente, can be found on the Facebook page for our practice: http://www.facebook.com/pages/Alpharetta-Endodontics/137382942943581 I would urge those interested in endodontics to check us out there as well. This past week, I evaluated a patient who's tooth reminded me of the case previously presented here on June 7th by Dr. Hales. Since it was so similar, I thought it would be a perfect follow up and first post. This patient had #2 treated with root canal therapy 1 year ago by another endodontist. I am familiar with this endodontist's work from other patients requiring retreatment and know that he does not use a microscope. He also tends to limit most treatments to one visit. The patient described symptoms as an occasional spontaneous dull ache of varying intensity that has persisted since initial root canal treatment. At worst, the symptoms are moderate with some pulsing or throbbing. 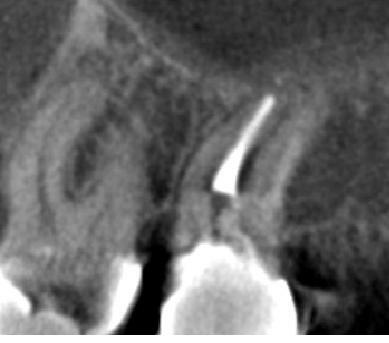 At the time of evaluation, the patient was experiencing a mild awareness of the tooth, a common description of symptoms from a failing root canal. Prior to root canal therapy, symptoms were similar, but more intense, and the patient has no recollection of any hot or cold sensitivity at that time period. From this information, we learn the tooth was likely necrotic prior to treatment, which is relevant when understanding possible challenges to disinfection. The symptoms are well localized, and the patient points directly at tooth #2. The tooth has been reevaluated by the previous endodontist and by the referring dentist. They adjusted the the occlusion and prescribed antibiotics. The relevant medical history consists of prior dual knee replacement surgeries in 2009 and 2010 necessitating antibiotic prophylaxis. The patient is currently taking clarithromycin (Biaxin) for a sinus infection, but the tooth symptoms predate the sinus problems by many months. Extraoral exam revealed no relevant findings. Intraoral exam revealed normal tissue contour and consistency with no swelling or sinus tracts. All probing depths were 2-3mm and percussion and bite tests produced only a mild discomfort on #2. In addition to the above two radiographs, I also examined a bitewing and two traditional film radiographs which I chose not to include here. One thing that stands out is that the crown margin is placed on the buildup, not an ideal situation. You can see only two canals treated and an in tact PDL. The orifices of the canals are clearly overenlargedand the obturation does not appear to follow the root anatomy. Drawn below is what I drew for the patient, predicting the true root and canal anatomy of the tooth and showing where I speculated there to be an untreated distal buccal canal. It appeared as if the previous operator perforated during instrumentation, not only between the mesial and distal roots, but also at the apex. 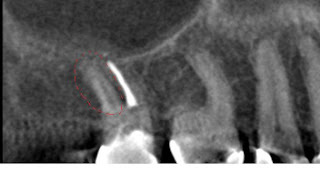 In addition to these root perforations, the coronal tooth structure is clearly compromised. The patient was anxious to save the tooth since she invested in root canal treatment and a crown within the last year. I did not feel retreatment would have a good prognosis and recommended extraction. The patient was understandably reluctant about this option, and so I opted to image the tooth with CBCT for more information and better patient education. In the below left image, I circled the missed DB canal. The below right images (one is reversed, please forgive me) display the missed DB root in the sagittal plane as well as the apical perforation and over enlargement (strip perforation) of the MB root. The below horizontal slice displays the previous instrumentation into the furcation between the MB and DB roots. I question if the radiolucent line mesial to the radiopacity is a fracture. The left and below images show a palatal radiolucency forming as well as the off center and possibly apically perforated palatal obturation. 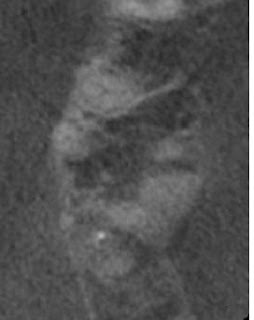 This last image to the left is a horizontal slice in the apical third of the root again displaying the palatal radiolucency forming. 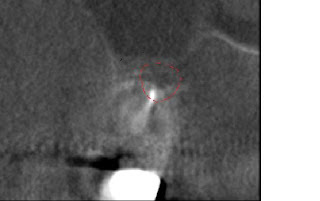 The CBCT shows this tooth has many problems that are not reliably correctable with endodontic retreatment. Finding the missed DB canal and even repairing the MB perforation in the furcation will not help recapture the correct path of the MB or P canals. 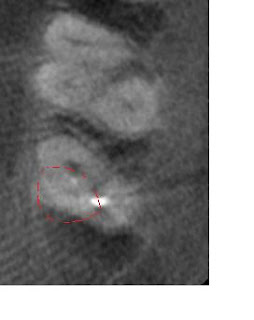 The CBCT confirmed with certainty what was highlighted in the periapical radiograph above. With these images, the patient was better able to visualize the root anatomy and obstacles to repairing this tooth. Consequently, the patient was much more accepting of the treatment plan of extraction. We are increasingly using the CBCT as a diagnostic tool in our practice, specifically in complex retreatment cases or in vague diagnostic situations. In this specific case, the CBCT images confirmed suspicions about root perforations and missed anatomy. They also displayed a palatal radiolucency that was not evident on the periapical radiographs. Lastly, and not to be overlooked, the images were invaluable for patient education and treatment plan acceptance. All CBCT images provided by Dr. Colin Richman and his Kodak 9000. This can be a very good research study as to how from the tooth the sinus problem is being tracked down.It is essential to get to the root of the disease to treat it surely. Thank you for the blog. The information have been provided in detail. One thing I can understand through this blog is that, even after a root canal, we should keep on watching the symptoms carefully as the problem may stay there still. Thank you doctor for sharing your experience with us! Sinus Surgery LA: The maxillary posterior teeth have a close relationship with the floor of the maxillary sinus. Symptoms from either source are easily confused. Certainly we work closely with ENTs in cases where symptoms are vague or not easily reproducible, and when our diagnostic testing does not support treatment. Additionally, we see many patients for dental evaluation after conventional treatment for sinus inflammation has been ineffective. Dental Implant Chicago: Thank you for your support. There is definitely strong support for recalling cases, especially retreatment cases and cases with a preop diagnosis of necrotic pulp. We plan all patients with a preoperative radiolucency for either a 6 mo or 1 yr follow up. That said, it is important that you understand the reason for posting these cases of persistent problems is to demonstrate the causes and errors of previous treatments that lead to failure. 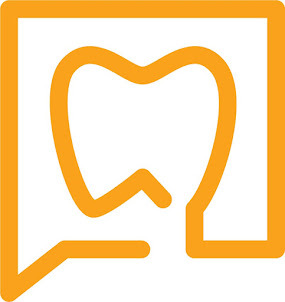 Most importantly, we want to showcase diagnosis and treatment planning for these situations to better help general dentists understand what an endodontist can (and cannot) do to help them and their patients. Unfortunately, I feel endodontists are being left out of the treatment planning process; teeth are being treated incorrectly; patients are not being presented the opportunity of going to a specialist to either do it right first, or correct it later. The number of failed endodontically treated teeth being extracted for implant placement that would not have failed if treated by the right person or could still be saved is inestimable. The Blame Game - Root Canal Failure?